#NepalEarthquake: Notes from the field: We shall rebuild | United We Blog! Food in central Nepal means rice. Then lentils and cooking oil. The northern villages also need salt. They do not really need fancy bottles of mineral water, snacks, bhujia, biscuits, noodles, brand new saris, or the Bible. Do-gooders feel good after doing “something,” but a token handout of 50 packets sent to a VDC with 1700 households is confusing, not helping. If we cannot cover the entire VDC, focus on smaller units, but cover everyone affected in the first round. Then, equity becomes a challenge where self-selection is useful, and external handpicking is tricky. The USGS numerical aftershock analysis has the probability of quake(s) measuring more than 6 on the Richter scale at over 23% between May 2015 and May 2016. People remain terrified to re-enter their cracked houses. Those keen to start a makeshift shelter need help from the security forces with the clearing to salvage old material. Several villagers said, unprompted, that they will now opt for a different model of settlement: wide road flanked by contiguous houses “like in bidhesh.” Shelter needs to be addressed in three phases: pre/monsoon (next 6 weeks), transitional (one year), and permanent. Given the shortage of labor and time, owner-led initiatives with help from the state in cash and kind (wood/bamboo, nails, CGI sheets) is the main demand for now. The CDO’s authority reigns supreme in the districts. In the capital, the Home Ministry is not the only center of power. This partly explains why coordination has been better on the ground than in Kathmandu. 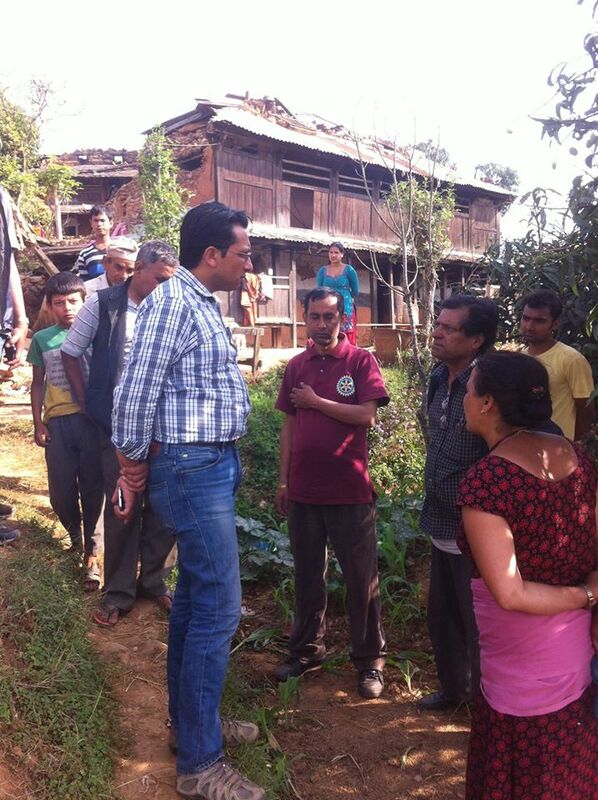 In both Dhading and Gorkha, I met the CDO and assistant CDOs, sleep-deprived but calm under pressure. Heads of district offices (about 30 on average) were all assigned to tackling some aspect of relief. The “irrigation” guy had the unenviable task of speaking polite English with foreign groups each morning. Additional personnel had poured in. In Gorkha I met two somber policemen seconded from Pokhara who quietly finished the task of recording the scale of destruction of all households in one village (Namjung). It took them six days. The enormity of the challenge is so overwhelming that the narrative of willful delinquency just does not wash. In Dhadingbeshi, I met the famous SSP Ramesh Kharel sent from Chitwan with a large group. I am no blind defender of the government, but I am a stickler for electoral legitimacy. As the Chief Secretary explains in this article, government efforts have been unprecedented, with about 1800 officers, hundreds of security personnel and engineers now in the field. Yes, most elected politicians appeared indifferent initially. The absence of over 200,000 local office bearers for nearly two decades also aggravated the void. But for all its faults and shortcomings, I came away appreciating the role of the government much more, knowing that “the government” is not a homogenous entity. We now need people committed for the long haul. In a week or so, the fundraising will subside, the genuinely well-intentioned will head back to their day jobs, some pretentious do-gooders will sit pretty on a plan of career and business, the journalists will have parachuted to the next crisis leaving behind a lazy narrative of a “corrupt, inept state.” As I stared at my ruined house in Bungkot, I could not help imagine the coming test of commitment: after the dust settles, who among us will remain standing for the painstaking task of rebuilding? Finally, to the thousands of Nepalis and foreign friends, who acted in good faith, gave it all, and sprung into action during rescue and relief, I say thank you. To those who have never paid a single rupee of direct tax in Nepal, but were generous with the vitriol, I say you’re still welcome to help improve our country and its government from within or outside. And to those who got a little excited: insult me, fine, but kindly spare the sanctimony from a distance.